Google Chrome is the only popular browser that doesn't have native support for feeds: it doesn't detect or preview feeds and it doesn't let you subscribe to feeds using your favorite feed reader. Most of these features are available in Firefox, Opera, Safari, Internet Explorer, but they're implemented in Chrome using an extension. "We originally intended to include RSS support by default as a native feature of Google Chrome (and we still might in the future) but we decided instead to implement this as an extension. This decision was made based on our philosophy of trying to limit ourselves to adding only the UI features that a vast majority of users need and allow each user to customize the browsers to fit their needs with Extensions. Given that most people are not familiar with and don't consume RSS feeds, we thought that RSS support would be a better fit as an extension, at least to begin with." Maybe not all users know the definition of a feed, but not many people know what a browser is and that doesn't stop them from using a browser. Orange icons for feeds are everywhere and many sites display them prominently. It's strange to see that Google Chrome doesn't have native support for feeds, while Google Reader is the most popular online feed reader, Google's FeedBurner is the most popular service for managing feeds, most Google search services have feeds for search results and even Chrome's blog links to an Atom feed. What's even more surprising is that Chrome doesn't parse XML feeds to show a human-readable preview. Google Chrome doesn't even recommend users to install the RSS subscription extension. If you'd like to see native support for feeds in Google Chrome, star this issue. Although this would be nice, I believe a bookmark sidebar is more important. I've seen forums with well over 200 posts asking Google to include a bookmark sidebar. Just check out the Google chrome suggestion forum, there's a ton of requests for a bookmark sidebar. You seem like you are on a mission to add unnecessary wight to Chrome, asking what features it's missing and now this, it's supposed to be light and if you are so obsessed about the RSS button just download the extension with it a more that adequate solution. This has been one of a few reasons stopping me from making Chrome my prime browser. Acquired and Starred. I use Google Reader for my feeds and having this feature stuck in a browser is an absolute waste of resources. I can access Google Reader from anywhere whereas the feeds in browser are stuck in one OS. I think google is right here. Not that many people use feeds, mostly just the very nerdy web users that wouldn't think twice about adding it on as an extension anyway. Most people would rather go to the actual website instead of reading the snippet. This was about detecting and previewing feeds, not about including a feed reader in Google Chrome. If a browser doesn't detect feeds and doesn't show the orange icon in the address bar, it may be difficult to subscribe to a feed. What Chrome should do is implement things like the RSS icon as extensions that come preinstalled (like they are doing with Flash Player). That way they are already there but can be disabled if wanted. @Tantalus The extension lets you subscribe using Greader. Or you can use TPGoogleReader. Since when Chrome is for grandmas ? Whoo an orange icon.. how scary ! If it's true that most people don't use a reader, then for sure the situation will not improve if there isn't a collective effort to make it easy to use readers. It's a foolish decision IMO. Most "mainstream" people may not subscribe to RSS, but Chrome was destined to be used initially by the early adopter crowd, not the IE6 crowd. Furthermore, I don't see how it could ever be a justifiable decision to leave out a feature that essentially breaks a user's interaction with a significant portion of the web. As it stands now, I feel that the feed support built into IE, Safari, and Opera is pretty useless. It's nothing more than an alternative version of the page. I think Chrome should take page from Firefox and render a preview of the feed with various ways to subscribe to it in other web or desktop based feed readers. Beside enhancing UI features in Chrome ,Google should include native support for at least upcoming releases. Then what about live bookmarks?Does future Chrome supports live bookmarks which I am eagerly waiting to see. ok.. that explains why you dont show an icon per default. But why the hell didn't you even include a default stylesheet (or any other way of making the display of a feed != a series of urls, times and text without linebreaks) for displaying a feed? You'll bundle flash but not a rss feed detection/handling? Fail. Chrome is my main browser and this has been a pita since day one. That extension just isn't good enough. There is no URL displayed to copy or pass to extensions like QR Code. I can't even view the source! Want to avoid UI bloat? Great, add a checkbox to "Under the Hood" to enable the feed icon. 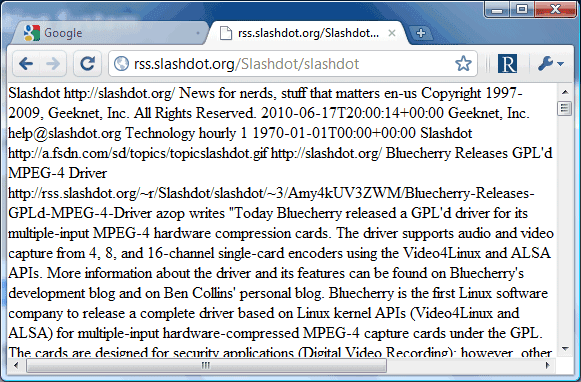 RSS/Atom feeds have been as much a part of web browsing as HTML for years. Don't show the Orange Button in the Address bar, BUT at least Render something, don't return garbage to the user that looks like an error in the page. Seriously, why do you want it sooo hard in chrome? There's an extension! Let them rather enhance the extension to your wants and needs than adding unnecessary junk to a great and lightweight browser. RSS is really not used by many, do you want native facebook/whatever support next? Sorry, are you under the impression that a few CSS rules compare to native Facebook support? I'm all for keeping things minimal, but please be a bit better educated about what a feature actually requires before you choose your battles. I'm all for keeping things neat, uncluttered and fast - which is what Chrome is all about. But why can't they at least offer some integration with your Google Reader account, so adding feeds is one-click simple? This is my number one peeve with Apple's Safari, which is an otherwise excellent browser. I don't have a problem with them not putting it there by default (use an extension) -- however, the warning messages that you get when installing an extension are scary --- so much so that I have held off installing any. The only reason why i am not switching to chrome is the lack of an good rss reader. In Safari i have 5 Rss feeds in an Bookmarks folder. I can instantly see if one or more of my 5 favorites sites have been updated without visiting them or going to google reader. RSS is the future! Google get on board already! As web developers, the last thing we want to do add code to detect Chrome and Chromeframe in order to not display icons and links to our RSS feeds. Now in 2012, RSS support has become a standard feature of browsers and Google's decision to not support it is just an annoyance to site developers -- the same kind of annoyance that causes people to complain so much about Microsoft and Internet Explorer's eccentricities. Sure I can install the extension to Chrome but that doesn't help the visitors to my site. If we want them to know about and view our feed, we have to detect Chrome/Chromeframe and put up a notice and perhaps a link to the extension. I have yet to see such a notice. So Chrome users are left out in the cold so to speak. Not very friendly. 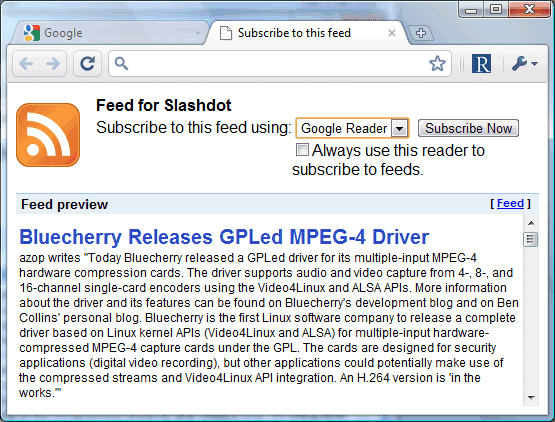 RSS Feed Reader for Google Chrome enables you to follow your favorite sites within Chrome browser. It installs from the Google Store as a one click. You can get instantly notified when a website present in your list updates its content. The notification can be easily turned On or Off, because it can be disturbing to see a pop-ups when you’re working on the computer all the day long. You can read about this on internet and after getting much detail about it you would definitely want to subscribe it. And trust me guys you would also going to love this. Any revert back would be highly appreciated. I think its inexcusable for a web browser in 2013 to not have native rss support, particularly one made by a company that, until recently, had a vested interest in them. Yes, it's a niche thing, but it's not going to get any less niche if people aren't introduced to the concept. I'd wager "Grandma" doesn't understand the concept of tabs so the "gotta keep things simple" argument doesn't hold much water.